Merges the natural anti-inflammatory gifts of lavender with the relaxing benefits of White Tea in a roll-on which goes on lightly, unlike most roll-ons on the market today. How to Use: Apply to clean skin. I love this stuff! This is the first natural deodorant that has kept me smelling fresh throughout the day (I work in the trades, so that's no easy feat!). Best natural deodorant I have used BY FAR! Love the fresh, subtle scent and the protection it provides (without the harmful chemicals or metals!). Excellent! I have been using it for a few years and it keeps you protected with a subtle perfume and a natural product. I recommend it. I'm giving this a 5 star bc the smell is nice and light, it actually works, and it's natural! Best to let it dry before putting on clothes. I've tried SO many and they don't keep you from smelling like this deodorant does. I mean, if it's 40C and you're sweating buckets, it may stop working by the end of the day, but on a regular day, it works and I'm happy about that! I've tried a lot of natural deodorants. This one beats Natures gate and Toms by a long shot. The smell seems a bit strong as soon as you put it on, but as it dries it becomes less noticeable. And it does a great job. Lasts all day. I think I will try the other scents to see if I prefer them better. Nice light scent. As a natural deodorant, it works well too. Smells very nice, and works decent compared to other natural deodorants. It doesn't keep me from sweating, but it keep me smelling nice all day. For a natural deodorant, this deodorant works pretty good. I am yet to find a really effective natural deodorant, that lasts all day, and has a nice, natural scent. This one is better than most that I have tried, but I will continue to search for a better one. This deodorant actually works! I'm a bit suspicious of the ingredient fragrance since it can mean many toxic chemicals, though. Wonderful replacment for aluminum products which I can't wear. Have tried a lot and love this one the best. I've been using this product for the last month & wouldn't hesitate to purchase it again. This is a wonderful deodorant. It rolls on smoothly & doesn't leave a sticky residue. As the other reviewer said, the fragrance is light & fresh. I highly recommend this product. I love these crystal essence roll-ons. I thought this fragrance might be too strong but it is light and fresh. 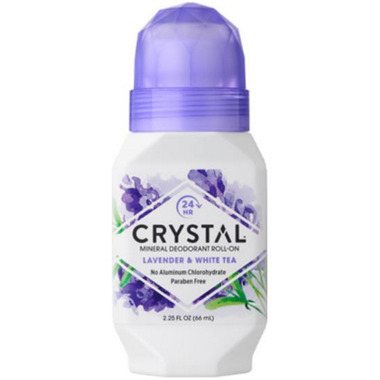 I have tried other crystal deodorants and this line of products is the best. I live in a hot climate in the summer and I have a hard time finding something that I am satisfied with in terms of odour control but this is great. I will continue to purchase this product!